Ferrara’s Heating & Air Conditioning, Inc. is proud to announce that the dealership received a 2016 Trane Top Gun Award, one of the highest distinctions for Trane dealers. 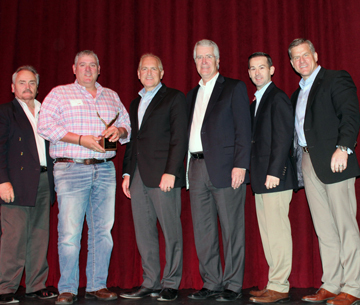 This honor is presented to Hunton Distribution’s top ten dealers in recognition of achieving the highest level of Trane equipment sales, both in retail and residential new construction. 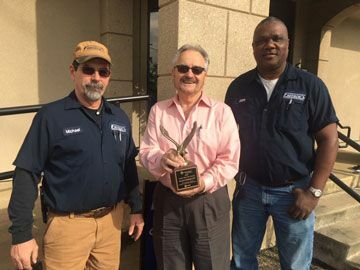 The award was presented to Brannon Ferrara, Vice President and General Manager of Ferrara’s Heating & Air Conditioning, Inc.
You may think of your Lufkin, TX air conditioner as “old faithful”—always there when you need it. However, sooner or later, it will succumb to the ravages of age and need to be replaced. AC repair will only get you so far, and then you will need to think about a replacement. Check out the signs below to determine whether air conditioner repair or replacement is the best option for you. 1) The age factor—if your system is older than 15 years, you may want to consider replacing it. The unit may last longer, but will slowly become less efficient and begin to cost you more money than a replacement would in the long term. 2) Increased cooling costs—many issues can cause your heating bill to spike, so AC repair might be a better option than replacement. A sudden difference compared to the past few years might indicate it is time to look into a new air conditioning unit. 3) Frequent AC repairs—if you’ve had your unit repaired frequently during the last two years, it may be time. The last two years of an air conditioner’s life tend to have the most repairs, and of course, the most repair bills. And again, once you start laying out money on repairs, a new AC unit starts to look more economical. 4) Strange sounds—air conditioners will make some noises as they run, but they shouldn’t rattle, pop, or bang excessively. This is a sign that your unit is nearing the end. In addition, if your blower turns off and on frequently and blows warm air, the air conditioner may need to be replaced. 5) The house is never comfortable—and resetting the thermostat doesn’t seem to help. Perhaps the thermostat is not working or perhaps the air conditioner is no longer distributing cool air properly throughout the entire house. Check the thermostat and if it is working correctly, you may need to consider replacing your AC unit. Do the math: how many of these signs apply to your home? You may be able to get by on some simple air conditioner repairs. However, if you decide you need a new air conditioner, call a reputable heating and cooling company in Lufkin, TX. It’s the middle of February in Lufkin, TX, suddenly you wake up and your home is freezing cold. You stumble out of bed and find that the thermostat reads 58 degrees. This situation could have been avoided with regular furnace maintenance. Often, homeowners skip the annual furnace maintenance inspection and then regret it when something goes wrong. Below are some signs to look for to indicate your furnace may need maintenance. 1) No heat—the most obvious sign that something is going wrong. Call an HVAC professional for a thorough inspection to diagnose and repair the furnace. 2) Unexpected rise in your energy bill—your heating system is probably not working at peak efficiency. Furnace maintenance can help your system become more efficient. 3) Your furnace has a strange odor—you should expect a faint odor of burnt fuel, but if it is overwhelming, smells like unburnt gas or rotten eggs, or is stronger in the rooms closer to the unit, you need maintenance. 4) Loud noises—you should expect some noises from your furnace, but loud banging noises generally indicate that the blower motor is in need of repair. 5) Carbon monoxide detector sounds the alarm—the furnace is probably not burning fuel completely. If this happens, turn off the furnace and all gas appliances, open the windows, and summon the fire department. Once your home is cleared to enter, have your furnace repaired by an HVAC professional. 6) The pilot light is orange or yellow—the pilot light’s flame should burn blue, if you notice that it is orange or yellow, your furnace needs maintenance. 7) Your furnace is aging—furnace maintenance is more important the older your furnace gets. A furnace that is 10-15 years old, should have regular (yearly) maintenance. 8) The furnace needs frequent repairs—if you feel like you just had the furnace repaired and it turns out it was less than two years ago, this is sign your furnace needs yearly inspections and maintenance. 9) The furnace turns off and on a lot—this could indicate faulty wiring, a fan motor that needs to be fixed, or a malfunctioning thermostat. Regular furnace maintenance not only helps your furnace run more efficiently, it also provides your home with improved air flow and better indoor air quality. If it’s been more than a year since you last scheduled furnace maintenance, make an appointment with your HVAC professional in Lufkin, TX as soon as possible. How often does my heating supply need professional attention? This question is important because all systems need routine checkups. Checking your system bi-annually can ensure your family’s safety from gas leaks. Also, bi-annual checkups provide attention to parts that may need replacement or repair. Being proactive with these issues will save you in the long run from costly emergency situations that usually occur late at night or during the most inconvenient times. Do I need to do anything to help keep my unit working? This question is important because there may be maintenance you can take care of easily. Simple actions such as changing or cleaning a furnace filter on a schedule can help you avoid an expensive unnecessary service call. Keeping up on general maintenance of your system will result in fewer service calls and shorter times when your system does need a maintenance call. How often do I need an HVAC technician to come out? This question is important because most don’t know a lot about HVAC units. Making sure you have the right company and number to call when there is an issue will give you peace of mind all year round. Now that you know, where do you start? Ferrara’s is here to help. We’ll answer these three questions for you. Of course there are other questions you may have, so give us a call today. We’ll show you why we are one of Lufkin’s premier HVAC companies. Heating systems are some of the most important functions in a Texas home when winter time rolls around. Unfortunately, minor heating problems and repairs often take a back seat on the to-do list. Even in cases less severe than a total shutdown of the heater, there are issues that could lead to the eventual breakdown of your heating system. There are several signs that should prompt you to call a Lufkin home heating professional. 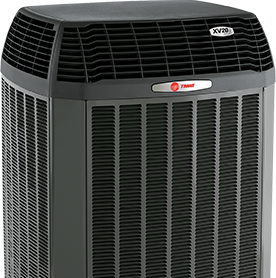 Utility bills will naturally increase as the outside temperatures drop and you begin using your heater more frequently. However, if you have been running your heater on a regular basis and suddenly notice a sharp increase in your utility costs, it could be a sign that your heating system needs maintenance. It is possible your heater is not operating efficiently and is therefore requiring more energy to produce the same amount of heat, costing you more each month. All heaters make some degree of noise when they are operating, but if you begin to notice loud or unusual noises when your heater is running, it is probably time to call in a professional to evaluate your home heating system. Rumbling, popping or rattling sounds that you have never heard before are all good indications that there may be a problem. Heaters that are functioning properly should warm your entire home evenly from one room to the next. On the other hand, if a heater is in need of repair, it may leave some areas too cold while other areas become too hot. If you find yourself constantly adjusting the thermostat to compensate for irregular heating throughout your home, it would be wise to have your system checked out by a local Lufkin heating technician. Neglecting minor heating problems can lead to major heating problems down the road, often at inopportune times. If you are experiencing increased utility bills, hearing unusual noises or noticing irregular heating, it is time to have a home heating technician come out and check your system.